I have four cars and two of them do not have factory navigation. I prefer using a portable GPS to my phone, and mounting the GPS has always been a frustrating exercise. If you use the suction cup to attach it to the windshield, it blocks your view and often falls and hits the dashboard at the most inopportune time. If you secure the circular plastic mounting plate with adhesive to your dash, you disfigure your car and it still blocks the view. The bean bag friction mounts slide around and move when you use the GPS touchscreen. Finally, I have found a product that mounts the GPS in perfect position, holding it firmly in place where it does not block your view. It is so solid and secure that it feels like it is part of the car. Best of all, it does not disfigure your dashboard and can be easily removed at any time. The mount is the ProClip, which is made in Sweden and imported by proclipusa.com. ProClips are ordered as two pieces, a device holder and a mounting base. 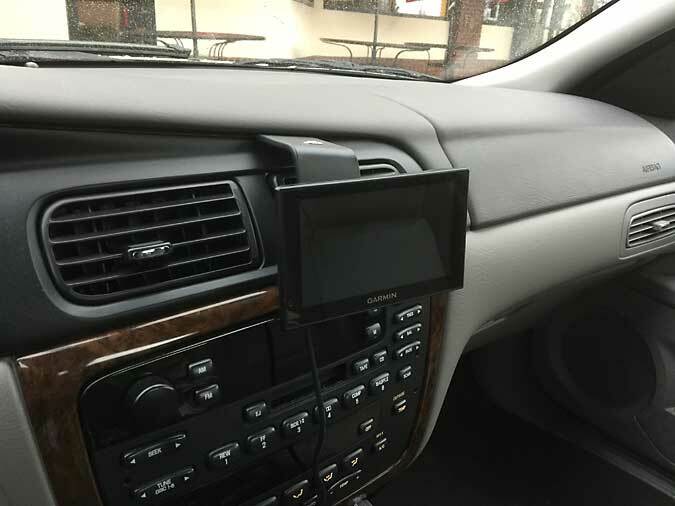 At the ProClip website you enter the device make and model to find the proper holder, then select your vehicle and the type of mount, creating a custom combination that works perfectly for your device and vehicle. The mounting base clips into spaces in your dashboard, using a separator tool that creates a small gap to clip the base in place. The device holder then attaches with self-tapping screws. Above you can see my Garmin 2539 mounted in my 2002 Mercury Sable winter beater/ski car, mentioned in chapter 46 of mylittlegabby.com. It feels like the GPS is part of the car now, and I absolutely love it. I was hesitant to spend $70 on a GPS mount but now that I have it, I am very glad I did. Besides, now that I invested in the system, if I ever change devices in the future I will only have to buy device holders, and if I change vehicles I just get a new base. The complete ProClip setup was worth absolutely every cent. If you are looking for a mount for your cell phone or GPS, this is by far the best I have seen. ProClip has an amazing breadth and depth of devices and vehicles in their inventory and it is hard to imagine a combination they can’t accommodate. Learn more at www.proclipusa.com.